The fine weather and light winds continued so on our way to Ilha Grande we gave the motor, with its refurbished fuel pump, a good run. When motoring along in calm seas we soon get bored - the scenic coastline is not enough - and usually Paul ends up delving in the lockers to find some "project" that's lurking there. This time it's a back-up autopilot, a low-powered unit which when combined with our Aries windvane (acting as a servo), will steer the boat on a compass course. 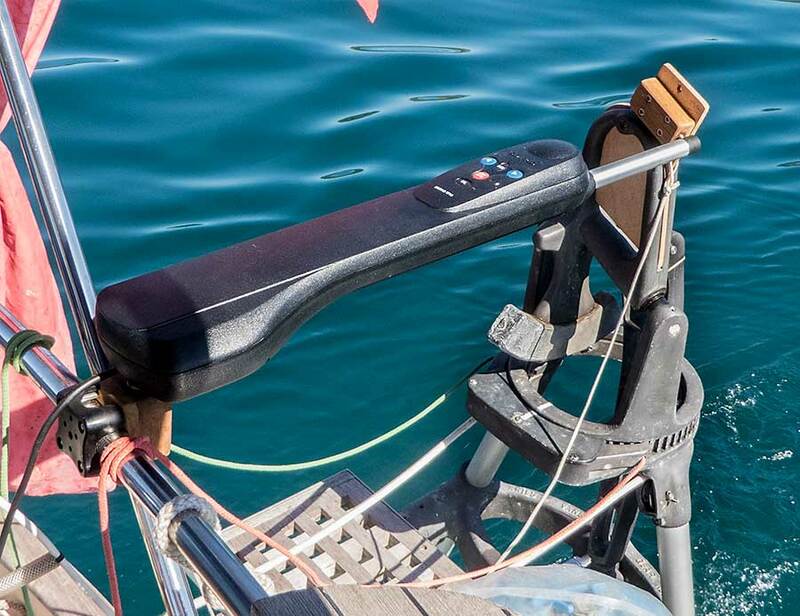 The problem with conventional autopilots is that they use a lot of power, are poorly engineered, and have to work hard in swell so don't last very long. With specially crafted fittings - to link the power-driven pilot to the windvane slot - it should work. So - after generating a lot of sawdust - we have the Mark 1 version installed and sea trials are underway. There were lots of fishing boats around so we also trolled our line, being careful to watch out for our featherered friend - the young boobie that desperately fancied our pink squid lure. As luck would have it we caught a bright yellow dolphin fish and hauled it in, but it jumped off the hook at the last minute. When later reporting our near miss we were told by locals that dolphin fish (aka dourade) are now rare here so it's a good thing it didn't end up on our supper plates. 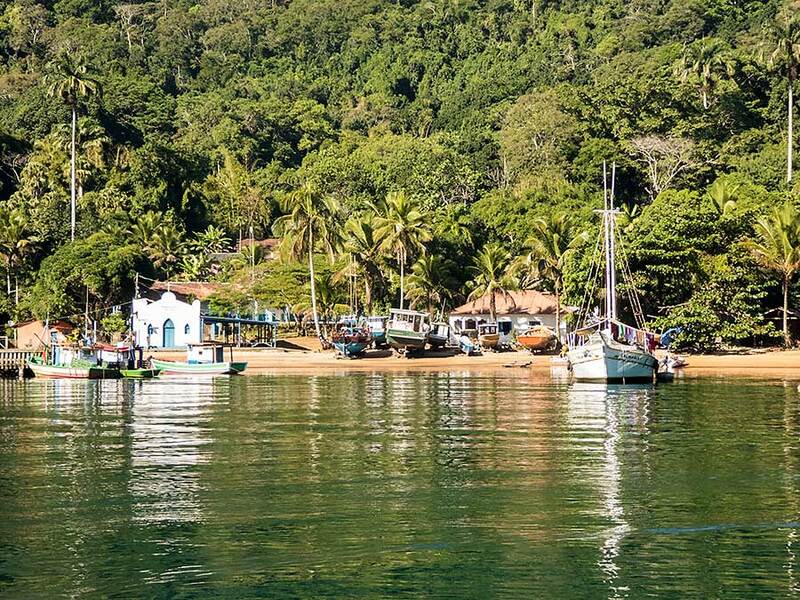 We dropped anchor at the western end of Ilha Grande, off the beach just inside Punta dos Meros. Being Corpus Christi holiday we were not surprised to find it quite busy with stinkpots. But by late afternoon the music stopped and we had the place more or less to ourselves. The water was very clear; we could see the bottom 8 metres down and found the best snorkelling we've encountered in Brazil: lots of pretty fish and a few starfish. The only problem is debris in the water: dead fish, bilge and plastic containers, presumably from the many fishing boats around. 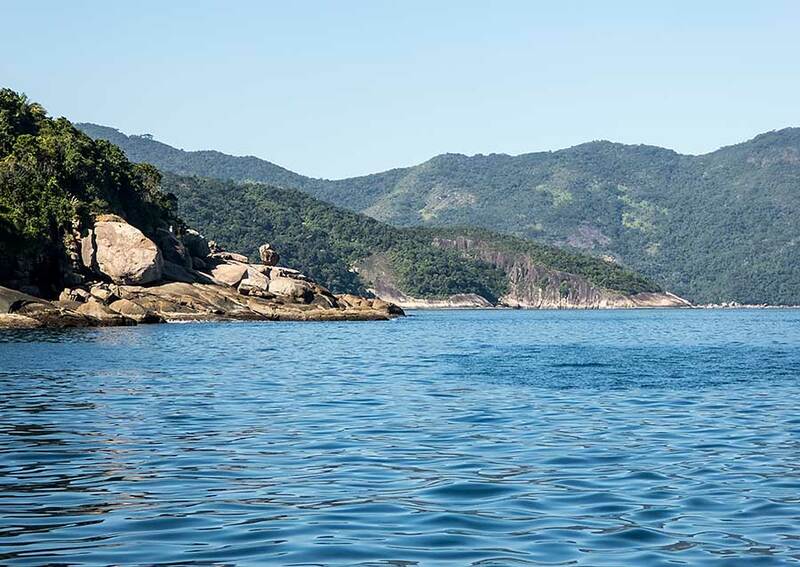 The next day we motored along the coast of Ilha Grande towards the north side. The coastline and headlands are fascinating: the tree-clad slopes rise to majestic peaks and the shore is lined with granite rocks forming their own unique shapes as they are worn away by the swell. We visited a few bays but found a lot of fishing activity and debris so continued as far as Ilha do Longa. 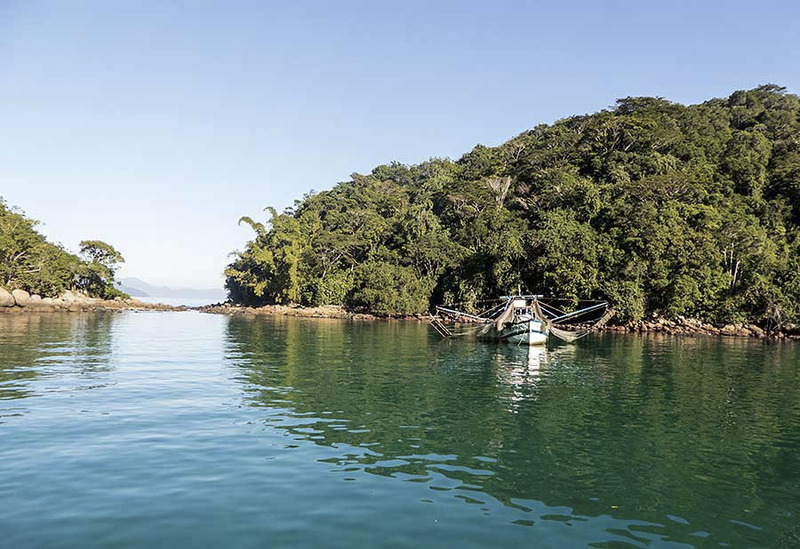 It's a popular little anchorage with clear water and a floating bar. Although busy in the early afternoon it soon emptied out as the sun went down and we had it to ourselves overnight - until fishing boats arrived in the early morning. Sunbathing or drying nail varnish? 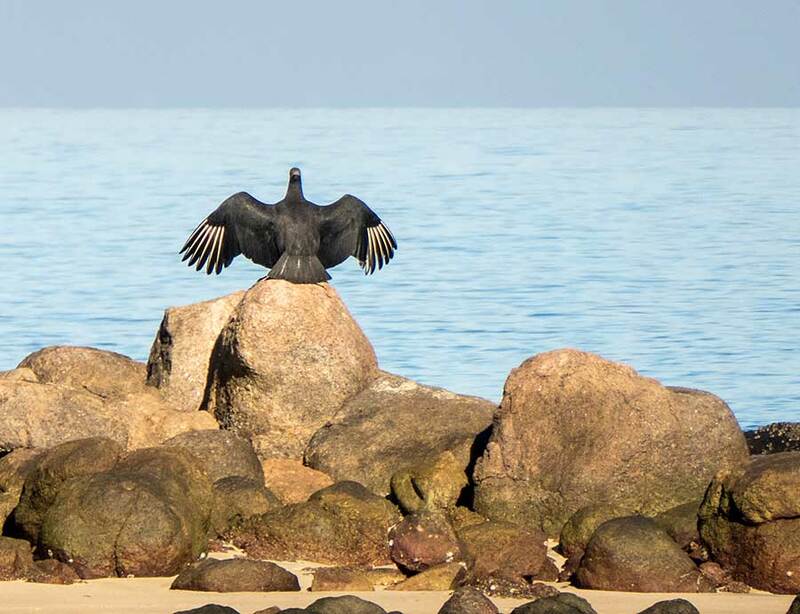 While at Ilha do Longa we got a call from Tio, inviting us to visit Bracuhy where a 2-day conference of the Association of Brazilian Cruising Sailors (ABVC) was taking place. We wanted to have a chance to say goodbye to Tio because he'd been such a great help with our engine problems. Even though he'd had to leave half way through getting it fixed, he was on the phone chasing everyone, including us, to make sure the refurbished fuel pump was collected and re-fitted in record time. We arrived in Bracuhy and were given a warm welcome by Tio and the ABVC, including a berth in the marina. Lots of the delegates were interested in our excursion to Somalia so we ended up giving an interview to Adriano - who speaks good English and produces videos about cruising (see www.hastagsal.com.br) - and an impromptu Q&A session (during one of the intervals between seminars) which Adriano translated. We sold all the books we still had on board and received honorary membership of the ABVC. All too soon it was time for us to say goodbye to Tio as he had to leave early on Sunday morning. While in Bracuhy it was also nice to meet some of the friends we had made during 2013. The marina manager was persuaded to let us stay another 2 days so we also had a chance to do laundry and shopping as well as eat at our favourite (Argentine) restaurant, the Estancia del Puerto. 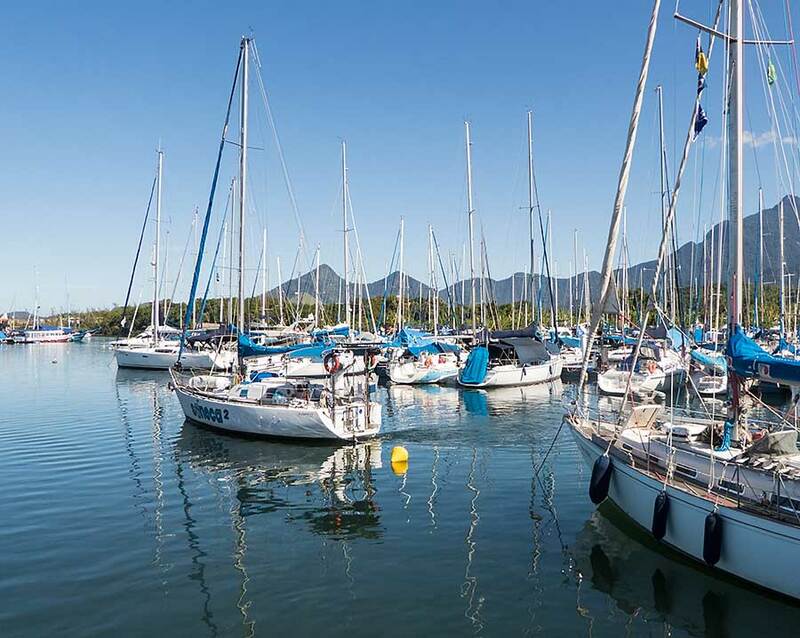 Bracuhy is a beautiful and secure place to live with ready access to a vast cruising ground. We could imagine retiring to one of the houses along the backwater with their own gardens and jetties. Though it's lovely, while there Rachel was always a little bit on edge: would ratty - or perhaps ratty's relations - come for another visit? The marina is beautifully kept and very clean but the memory of our unwanted guest in 2013 remains. When our time was up we left for an anchorage on one of the nearby islands called Cunhambebe Grande where we stayed a couple of days. When lifting our anchor to leave, a turtle came swimming to the surface but once it saw us it dived down again. We've spotted turtles in other anchorages but only briefly. They are shy but we regularly caught glimses of one amongst the moorings in Saco do Ribera. Here the water was so calm and clear we could watch it come and go for more than the usual few seconds. Our next stop was just a few miles away on the mainland. On the other side of the headland is Brazil's only nuclear power station. The cooling water is pumped through a tunnel to discharge in the bay, where the surface water is 28 degrees. It's a popular spot for snorkelling and we enjoyed the bath especially as by the time we had our dip the sun was setting behind the nearby mountain. The weather has now changed. Our indian summer is over and it looks like being unsettled for some time. With a bit of luck we'll get some wind for our passage west to Rio in a few days. In the meantime we have to visit the authorities in Angra dos Reis. Our first 90 days visa will soon expire so we need to get an extension.